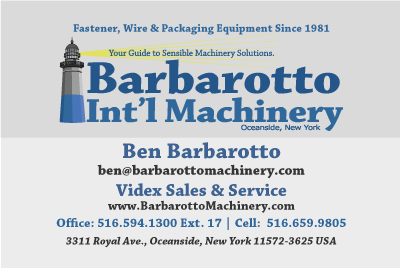 Videx Forging Machines are available in 300, 400 and 500 metric tons of forging power, covering the thread range of M-20 to M-48 (3/4" to 2") in the smallest machine and up to M-80 (3") in the largest machine. The length range is 200-1,000 mm (8" - 36") under the head. The hex is formed in a closed die or sliding punch and does not need trimming. The production rate is 4-6 parts per minute! Impact Cutter: Cutting long bars to length. Chamfer Machine: Accepting cut-to-length blanks from the Impact Cutter or from a single-row magazine. Extrusion Machine: Extruding the chamfered side. Induction Heating Station (Induction Unit not made by Videx). Forging Machine with Solid Die, Two Blow capability, your choice of 300, 400, or 500 metric tons forging capacity. Automatic or Semi-Auto versions available. 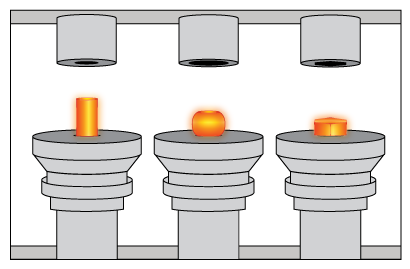 The forging machine has 5 stations; one In-feed station, two forging stations and two ejecting stations. The chamfered and extruded blanks are pushed into the die by a pneumatic piston. Then, the rotary dial indexes the solid die to the first forging station, which upsets the pre-form and breaks the scale. In the next station, the hex is formed in a sliding punch or closed die. After heading, the parts are indexed to the ejection station and carried out of the machine via conveyor. The machine is supplied with a spray system for cooling and lubricating the die and punch.